The crepes, as always, are from VwaV. The filling is pressure cooked lentils in veg stock (15-20 minutes) combined with pan-fried seitan, carrot, onion and garlic (15 minutes). 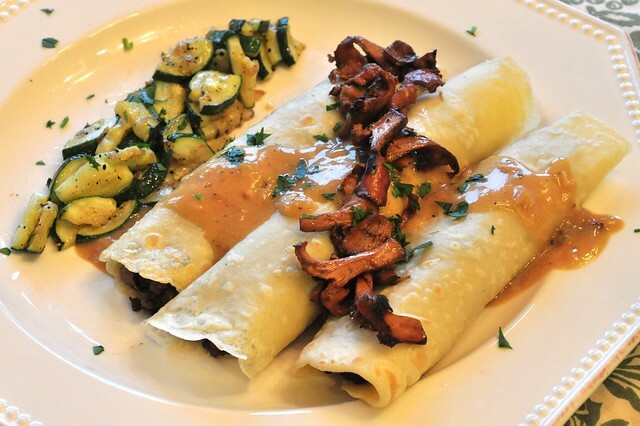 The crepes were topped with chanterelle mushrooms and a quick gravy (roux + veg stock + tamari). Served on the side was a quick saute of zucchini (olive oil, salt, pepper, parsley).